Old Red is a painting that I executed in 2005. I loved the repetition of circles in this piece. 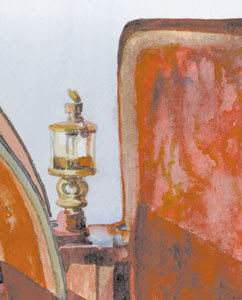 The textures of the old wooden wheels and the rusty metal surfaces was challenging and fun as well. You can look at the detail below to see some of the effects of wet washes to create the rusty areas. 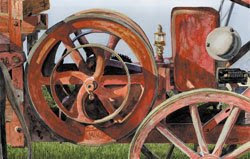 It took a few days to complete this piece as I layered many washes onto the shadow areas of this antique tractor. The original measures 13" x 20". I sent this piece to the Texas Watercolor Society Show in San Antonio, Texas in 2007 and it won an award. You can see a larger view of this piece on my website and prints are available on my etsy site.